Experience TRUE horror like never before, as you attempt to make it through our woods ALIVE!! 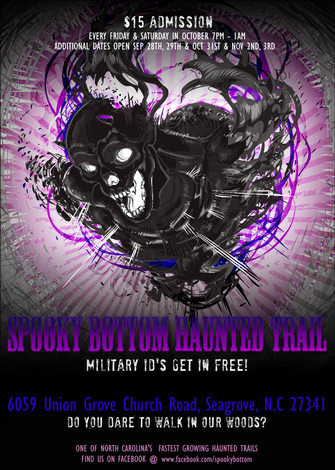 For 3 years now Spooky Bottom has been the home of some of the most terrifying creatures to ever roam the night, all thanks to the evil Dr. Edward who unlocked the doors to the Spooky Bottom mine shaft releasing all the horrors that had been locked inside since 1871. When workers uncovered something so horrible that they were even afraid to speak of it, they sealed it permanently or so they thought!!! The local community dares to speak of it because anyone who told the story and told the full truth of what really was uncovered that day in 1871 ended up going insane, claiming a man with peeling or burnt skin would visit them at night and show them horrific events that were from the past, present and future, they claimed he would burn images into there mind that they could never get rid of, things that were so intense and disturbing it eventually drove most of the witnesses to do terrifying things, it was like Dr. Edward was in there mind making them recreate all of his painful and terrifying experiments all over again. People have been in the area and claim they see evil beings in the shadows. Some say they have even seen Dr. Edward lurking the grounds, other reports say they can hear growling and snarling coming from these mysterious woods. One thing is for sure, many have dared to walk these woods but most do not make it, for the ones that do.... well they are under Dr. Edwards wrath now!!! Are you brave enough to uncover what really goes on here? Do you dare to tell your story? ?